HullSonic – Quality Ultrasonic Antifouling Systems are now available! The HullSonic Ultrasonic Antifouling System provides the latest in digital electronics and utilises the most advanced transducer technology to generate a barrier of protection on your hull. Drastically extending the life of your antifoul coating, improving fuel economy and saving you money! 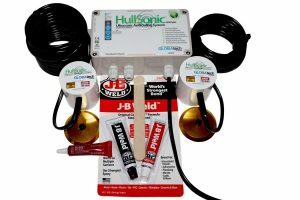 The HullSonic brand Ultrasonic Antifouling system was developed by Globatech Australia as an Ultrasonic Antifouling system for vessels up to 20m in length that could provide the same industry leading quality in production and end results as our other brand products while being substantially more affordable than the competition. We are able to achieve this through volume production and by reducing the number of final features. The HullSonic system, like all of our electronics, are manufactured in Australia.